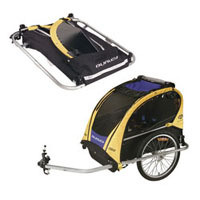 This light, maneuverable trailer can carry two children. Children are kept comfortable on the cool, flow-through mesh seat with generous side pockets for toys. The seat features 4-point retention and will recline for nap time.